Medium - $73.99 Only 4 left! We know you probably didn’t pick up your little munchkin from a claw machine in a pizza joint. But that doesn’t mean they are any less alien. (And, no we don’t mean chest-burster aliens.) They are the cutest alien to ever crawl on this earth. Sometimes people don’t see your precious little person as an alien though. You chalk it up to them not seeing your little guy eat, or poop though. (Whatever comes out of them is surely alien!) You want the world to see just how alien your baby really is, but you aren’t sure how to do that and keep him looking as cute as ever. 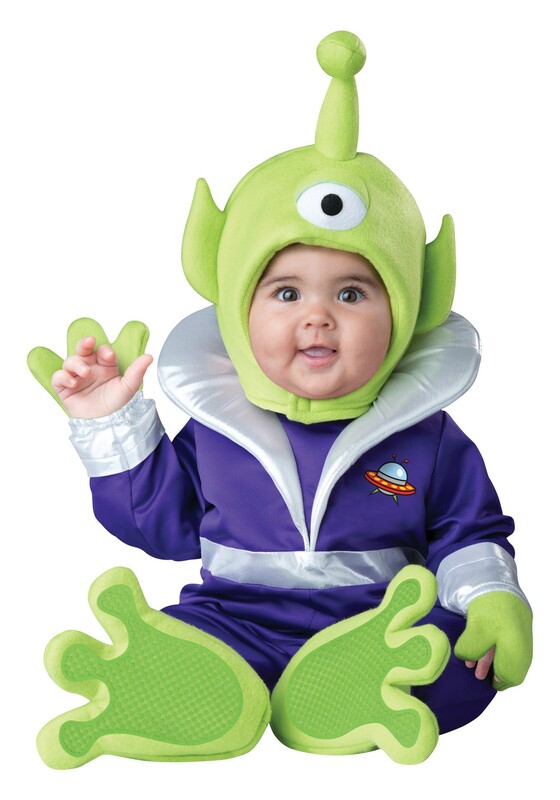 This Infant/Toddler Mini Martian Costume might be just the thing to show off how adorably alien your baby really is. He will be the classic Martian green, with the cute little antenna, and three fingered sleeves. He might get a little confused with the squeaky claw machine aliens from that kid’s movie in the 90s. But you know your guy is way cuter than those little toys. And when he is all dressed up as the little alien you always knew he was, he will be able to make friends with all the other little aliens that live on this planet. And if someone still doesn’t believe you about his alien-ness, just let them change his diaper after he has had green peas. They’ll start believing in aliens after that!